I crossed the finish line, again! I made it to a little over a year nursing Charlotte and couldn't be more proud!! I may have limped and army-crawled my way across the finish line, but I did it, and exceeded my goal. But not without the help and support of so many! I had mastitis more times than you can count on one hand, I lost track of the number of clogged ducts, and if you added up the amount of time I spent pumping, nursing, or washing bottles and/or pump parts, I bet it'd be a pretty big number and I'd think "gee, I could have accomplished something really big and amazing in the same amount of time." Oh, but wait, I did! I fed my baby, giving her the best nutrition humanly available, tailored JUST perfectly for her and the exact amounts she needed. I cut my risk for PPD and various cancers (breast and ovarian), lost the baby weight (and then some) quickly, and I saved about $2,000 in formula costs. Not to mention that I did something with my baby that no one else in the world can ever replicate. There were SO MANY times I wanted to quit. So.many.times. Pumping at work was something I dreaded and washing bottles and pump parts was really the worst of both the breastfeeding and formula-feeding worlds. There was constant worry about ounces and how long I could be away without being uncomfortable; the looming worry about having to supplement when I couldn't pump enough. I often felt like I was neglecting Anna while nursing Charlotte, especially during those bedtime sessions that could go on, and on, and on. There was no sleeping-in or being “off call” for a night during the year (plus) that I nursed. But, I wouldn't trade it for anything. It was my pleasure and a true honor. That said, it was also time for it to end. Charlotte was finding her independence, my supply was dropping, and, candidly, I was ready for a little “me” time. Charlotte weaned fairly easily, her evening session was the last to go. I still remember the first night I rocked her to sleep without nursing her. It was surreal, but we were both at peace with the new routine. She always has been, and still is, one of the biggest Mama’s girls you’ll meet, and it's good to know she doesn't hold a grudge. Mike and I are truly 50/50 in regard to our thoughts on having another child, and while we don’t know the exact path we’ll take, I do know that I've declared the “spring and summer of Jen” while we decide. I've gotten back into running, I’m taking strides to ensure I stay healthy and active; I’m wearing “big girl” bras, shirts that aren't easily lifted, and dresses. None of my clothing unassembles for easy access and I don’t have to worry about accidentally flashing anyone while trying to get my cover-up situated. And I’m down a bag that has to be packed, washed and repacked every day. I’d do it again in a heartbeat, and would love to consider supporting national initiatives or even becoming a lactation consultant one day as I’m pretty passionate about getting the word out and supporting the breastfeeding initiative and breastfeeding mothers. But, for now, I’m going to enjoy that second glass of wine, I'll enjoy traveling for work without having to worry about needing a fridge in my room, and I don’t mind if I do let Mike sleep in the guest room with both monitors so that I can get a good night’s sleep when sick. And while I’m at it, I’ll take the “good” cough medicine. ... when you have pants?!?! I spy with my little eye ... some little curls ! Charlotte's hair is growing like a weed and starting to curl up, just like her sister's. They still look nothing alike, but maybe they're have the same soft curly cues? "I think I'll only wear one of my princess skirts today." Said no toddler ever. Why wear one princess skirt when you can wear four? For reference, the fourth skirt is hiding just below the third (we only have so much torso to work with); the necklace is referred to as an amulet (and is a nod to Sophia the first); and the shoes she's wearing are her glass slippers. Got it? No? Don't worry, you'll be swiftly corrected. Anna and I had a super fun date at the Cincinnati Children's Museum last month; Gigi was supposed to go with us, but wound up staying home with Charlotte due to an ear infection and nasty cold. Anna's a bit in-between being ready and able to enjoy all that the regular museum had to offer (and a little too shy at times), but is a bit too grown-up for the toddler area. That said, we found plenty to see, do and explore and we had a blast! We played, we laughed, we sang, we built and then toppled over, and we ate lunch together afterwards. A trip to the gift shop, a selfie out front, and jumping down the steps on the way to the car completed our fun morning. I can’t believe that you’ll be three years old when I write this letter next month. Wow! Some days I feel like you’re two going on twenty and then you curl up in my lap or ask for a hug when you need reassurance and you’re my little girl all over again. You have a heart of gold and are caring beyond your years at such a young age. You’re growing and learning new things every day and sometimes it’s hard to pinpoint exactly where you picked something up. I joked a few months ago that I’d likely still be helping you get dressed and undressed when you went to college, and then almost overnight you’re doing it independently. Slowly and veeeerrryyyy deliberately, but independently. One day you insisted you put your own underwear and pants on in the morning, sat down, sorted out the back from the front, and asked me if you were putting your foot in “the right tunnel?” Shirts are a little harder, but you’re getting there, and are pretty good with shoes, only needing confirmation that “this is the right one, Mommy?” as you put them on. You also LOVE the rain boots your Grandma got your for your 2nd birthday, and I must admit they look adorable on you. We had to put a child-lock on the coat closet door to limit the use of the accompanying umbrella, but that’s pretty cute too. You’re getting much more opinionated about what you wear and I’m starting to lower my standards when it comes to matching or rotating outfits; as long as it’s clean and relatively fits, and gets you out the door before Noon, we’ll go with it. We’ve been trying to make a point to do special “Anna dates,” especially you’re older and can appreciate outings in a different way than Charlotte. Last month I took a day off work and we went to the Children’s Museum. It was SO MUCH fun. It was so great to just let loose with you and I enjoyed watching to you play and interact. I loved the questions you’d ask, watching you enjoy the stations, seeing your eyes light up when you had put the pieces together at a station, and all of the hugs throughout the day. You’re such a special little girl! We enjoyed lunch afterwards, took a stroll through the gift shop, played in the fountains outside the museum, and took selfies before we headed to the car. It was a perfect day and you were the perfect date. As much as you love alone time with us, you also love your sister fiercely. You tend to her when she’s not feeling well, encourage her when you’re playing, tolerate her hair-pulling, lack of social skills and toy stealing, and genuinely want what’s best for her. She was sick for several days last month and you wanted nothing more than to comfort her and help her feel better. You’d pat her head and back, bring her toys, and offer comforting words. It was true cute overload. Overall, you’re just more and more aware of the world around you and are able to understand situations regarding emotions. We’re working on “listening ears” quite a bit now and I hate to squash your creative juices, but sometimes we can’t spend 20 minutes in the morning playing while we’re getting dressed. I’ve started to try to make you understand consequences while keeping my cool and will often explain that I’m going to count to three and after that I won’t be as happy anymore. It seems to work as you’ll usually perform the task at hand (usually brushing your teeth) and will ask “are you still happy Mommy?” as you finish up. I went away on a girls’ trip for a couple of nights and the day I was returning you asked me over the phone “Did you go see the horsies, Mommy? And find your friends, Mommy?” I had been at Keeneland and I did find my friends, you were spot on! As grown up as you’re getting, you’re still my little girl. You still cling to me in new situations, look to me for reassurance, and give me the best hugs. Ever. With the sweetest little arms. I hope you’ll always delight in showing me something new you’ve learned, will need my guidance, and will keep on giving those hugs. I feel like the last month has flown by even faster than your first year, you’ve changed so much and are growing so fast! Over the last month you weaned yourself from nursing, are now drinking whole milk from a sippy cup and eating real food (no more purees), and just yesterday you took your first steps. 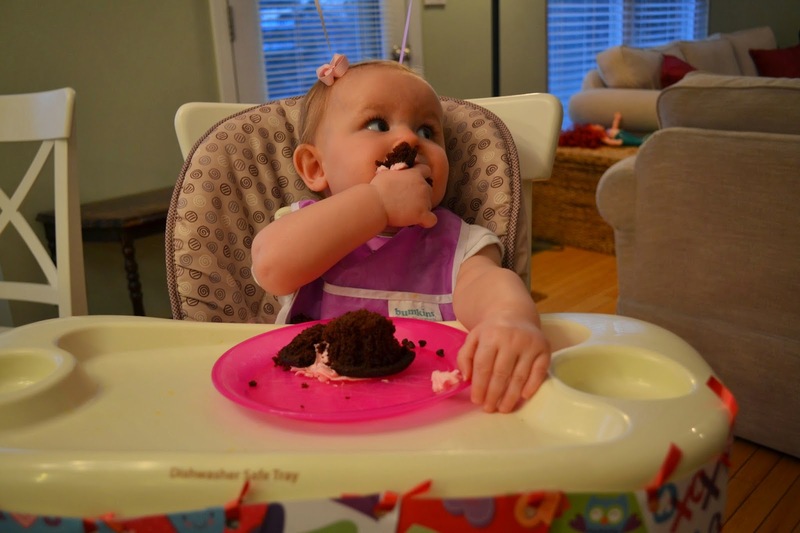 Where did the infant that smashed her cupcake into her face go? Because the little baby I remember has been replaced with a full-fledged toddler. Because of the timing, your birthday party took place a few days after your actual birthday, which meant we were able to celebrate for several days, and you loved all of the attention. You had so much fun seeing all of your immediate family, loved when we sang to you, loved opening presents (you might have loved the wrapping and tissue paper the most! ), and loved being the center of attention. You’re such a sweet and even-tempered girl, and although you have your Mommy-moments, you loved having such a big group around to celebrate you! You’re weaned now and although I miss the extra-special bond that came with nursing, we were ready, and not rushed, when it ended. I waited until after your birthday party and we slowly started trying different sippy cups; it took a few to figure out which one you liked the best and then it took about a week to get you used to the taste and temperature of whole milk. We supplemented with whole milk smoothies that you still like to drink, but you did amazingly well. I came down with a nasty cold a few days after your birthday party and that actually helped me finalize the weaning process. We dropped your morning session first and that was easy because it was replaced with breakfast in your high chair with me and Anna, and the night time session was the last to go. I will always remember the first day I rocked you to sleep without nursing you. I cried a little, but it was happy tears. We’d made it! I still rock you to sleep most nights and I will do that for as long as you’ll let me, it’s our special time and you’re my special girl. You continue to be a rock star eater and we can always tell when you’re not feeling well or overly tired by the amount of food left on your plate. You’re pretty open to most foods, but especially love fruit. We shop over the weekend for our weekly meals, but it never fails that we have to make a return trip by Thursday to stock up on more produce. You’re getting great at using those pincher fingers to pick up your food and will be ready to start practicing with a spoon pretty soon. You’re great at telling us “all done” in sign language at the end of the meal, but are still working on the sign for “more” … you currently just yell at us to indicate that you’re still hungry and would like a second serving. You love to wave say “hi” and wave “hi” and “bye” to anyone and everyone. Us, your teachers, the cats, even Mickey Mouse when he comes on the TV. You’ve also learned to tell us you’re “soooo big” by throwing those little arms above your head when we ask “how big is Charlotte?”, and the grin that comes with it melts my heart. You also love to read books. And I mean love. Before kids I would never have believed that an infant / toddler would actually understand anything about a book, but you do. You love touch and feel books and have a rotation of about four that are your favorites. You also LOVE Mr Brown Can Moo, by Dr. Seuss. You’ll sit and go through those five books for hours; you know exactly where they are stored in the bookcase and will seek them out. You continue to have one of the most pleasant personalities of any baby I know, you’re just a happy, happy girl. The only times you tend to fuss are when you’re tired, hungry, or not feeling well. You had a couple of ear infections last month and it broke all our hearts to see you so down and out, you ran a fever for several days and just wanted to cuddle. And, although I loved the extra snuggles, I was very happy to get my smiley girl back when you were on the mend. You moved to a new room at school this month, now with the more mobile and bigger kids, and did great. Your teachers were shocked at how content you are and just love you to pieces. You cried at drop off for a few days, but acclimated quickly and are the apples of Miss Heather and Miss Denise’s eye. You’re on your way to walking and took your first steps just yesterday. Or today if you count what we told your Dad. You’re getting more stable and can go from a squatted position to standing and back again pretty well and can coast around with assistance like a pro, but you’d yet to take any unassisted steps. Until yesterday at your Gigi’s. All of the sudden you stood-up, took 4 steps and then did it again. Your Dad wasn’t there, so we set you up to do the same thing when we got home : ) I’m predicting that by the time I write your next letter you’ll be off and walking full speed ahead. Watching you grow from a baby to an infant and now moving into the toddler stage has been such a treat and every “first” amazes us just like it’s the first time we’ve ever seen anyone, anywhere crawl, take a step, put a bite of food in their mouth. Your big little personality shines through in everything you do, from the minute you wake up when we hear you talking to your stuffed animals, to the big grins all day long, to the sweet snuggles at the end of the day. I can’t wait to be a part of so many more of your “firsts”, but hope they don’t come along too soon, because for now I love the special Mommy-moments and the fact that your Dad, your sister, and I are your first loves.